A couple weeks ago, I made my first order from the Goulet Pen Company. I'm really excited about the stuff that I got, so I decided to make this haul post about said stuff. I ordered late at night on February the 9th (Thursday), and I received the package on the 11th (Saturday). I bought a variety of fountain pens, fountain pen inks, notebooks, and accessories for fountain pens. 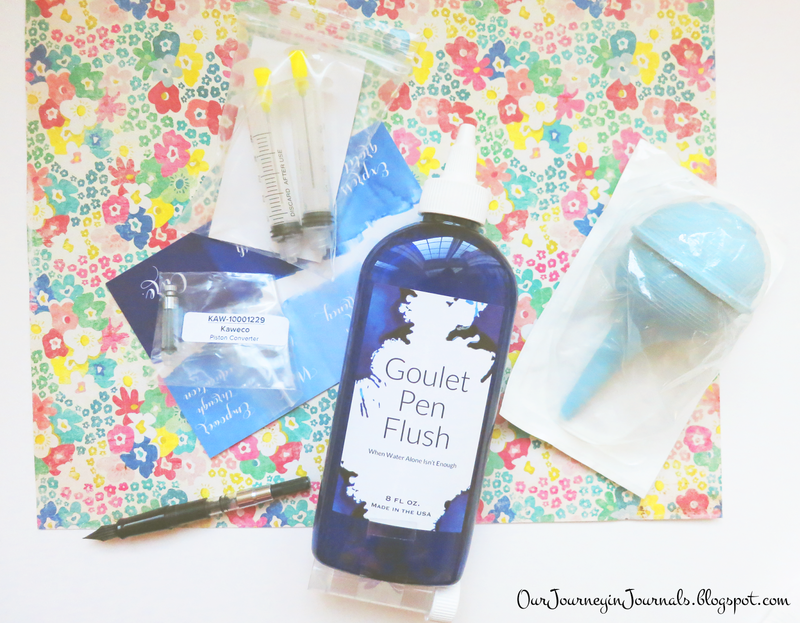 Goulet is famous for their incredibly extensive packaging, and I was not disappointed; all of the liquids were wrapped in case of any spills, and all of the paper products were also wrapped for extra protection. I didn't take any pictures of the package before I took everything out, but I filmed this video of me opening all of the products. There were also a couple of extra goodies, like a Tootsie Pop and a handwritten thank you note that includes what ink color was used (though I think there's also supposed to be a Goulet bookmark, but I haven't seen it :( ). Anyway, now that I've gone through some of the non-stationery stuff, let's go to the actual meat of the post, shall we? Random note: I've already a lot of these products (or at least opened them), so most of them are not in pristine, mint condition. First, I’m going to talk about the pens that I bought. I ordered 2 fountain pens: the Noodler’s Ahab Flex Pen and the Kaweco Skyline Sport. I've been wanting to get the Ahab, which is a flex pen, so I could do calligraphy with it. 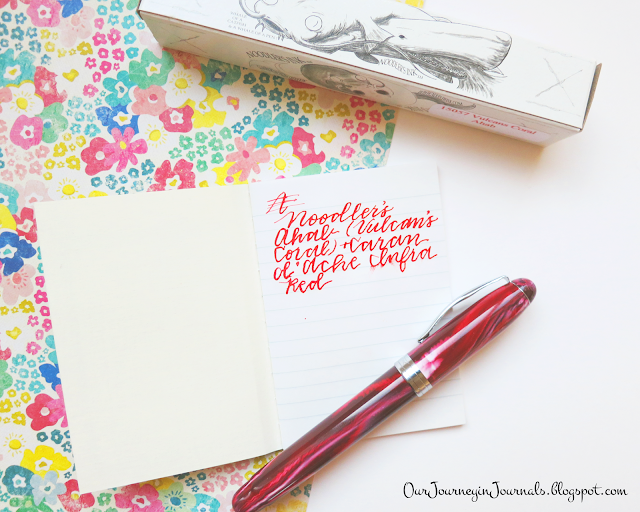 At $23, it's pretty cheap (for a fountain pen, that is), and I am a big fan of this color Vulcan's Coral. The tines don't spread as much as I expected them to, but I think that's just because I overestimated the flexibility of fountain pens (since I'm very much of a newbie with them). I originally had some problems with filling the Ahab (i.e. 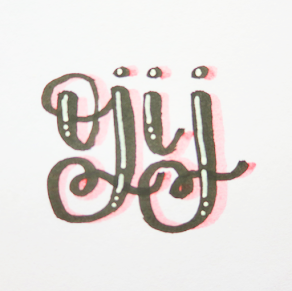 it wouldn't really fill), so I emailed Goulet customer support, and they helped me through it; I think the issue was that I just didn't have the nib completely submerged in the ink when I was filling it. Also, as a random note, this specific pen seems to have this sort of weird chemical smell to it. 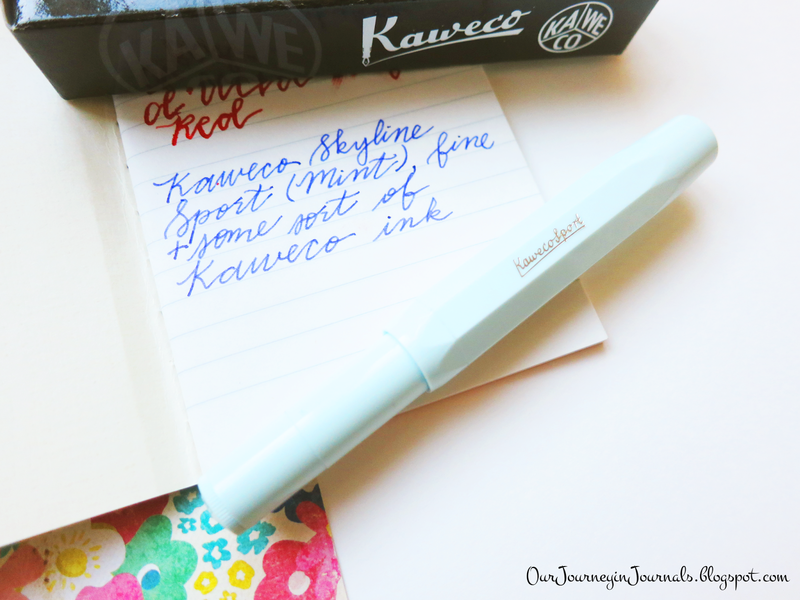 The Kaweco Skyline Sport I got is in the color mint and has a fine nib. It also came with a proprietary blue ink cartridge, but I also got a converter to go along with it. It's a pocket pen, which I knew beforehand, but it wasn't until receiving it when I realized how small it really is. However, it's about the length of a normal pen when the cap is posted. Also, both of these fountain pens have screw caps, which I keep on forgetting since I'm so used to using pens with snap caps. It's a little annoying (that I'm forgetting, not the caps themselves), but it's also kind of funny each time that it happens. I also got a couple of notebooks - okay, not gonna lie, maybe a little more than just a couple! 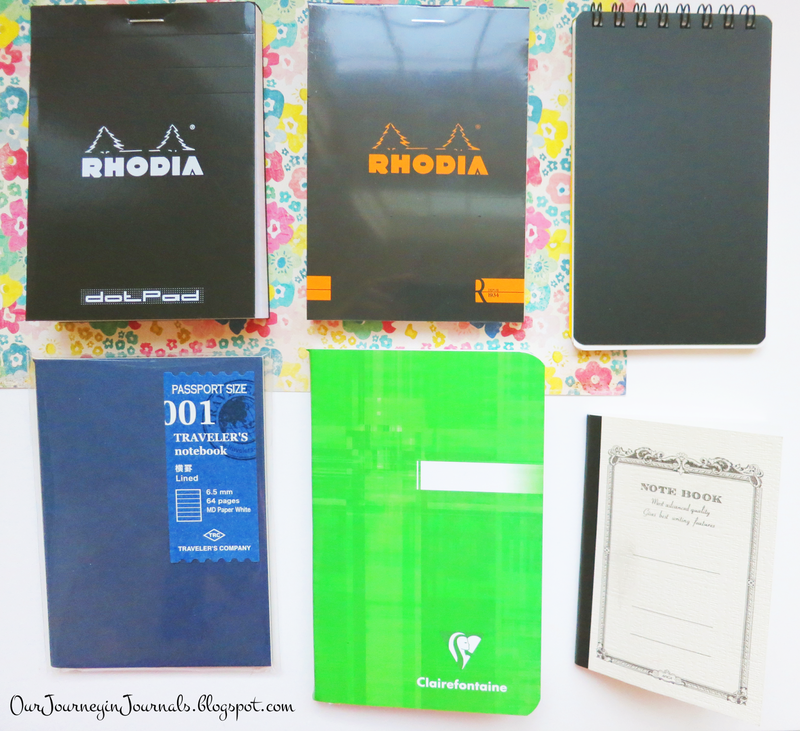 I got an A5 Goulet brand notebook (with 52 GSM lined Tomoe River paper) and a black Rhodia No. 16 (i.e. A5) notepad with blank paper. These are the only individual notebooks that I purchased in this order, and they came in a thick USPS envelope to prevent any sort of bending. Along with these two, I got a notebook sampler. Since the only other "luxury" paper that I've had experience with in the past is Moleskine and Rhodia stuff, I thought this would be a good introduction to some other brands. This package set came with a white Apica CD-5 lined notebook (which I've already got some ink stains on . . .), a green Clairefontaine Classic Staplebound lined notebook (3.54" x 5.51" size), a black B7 Maruman Mnemosyne N192 lined notepad, a black Rhodia No. 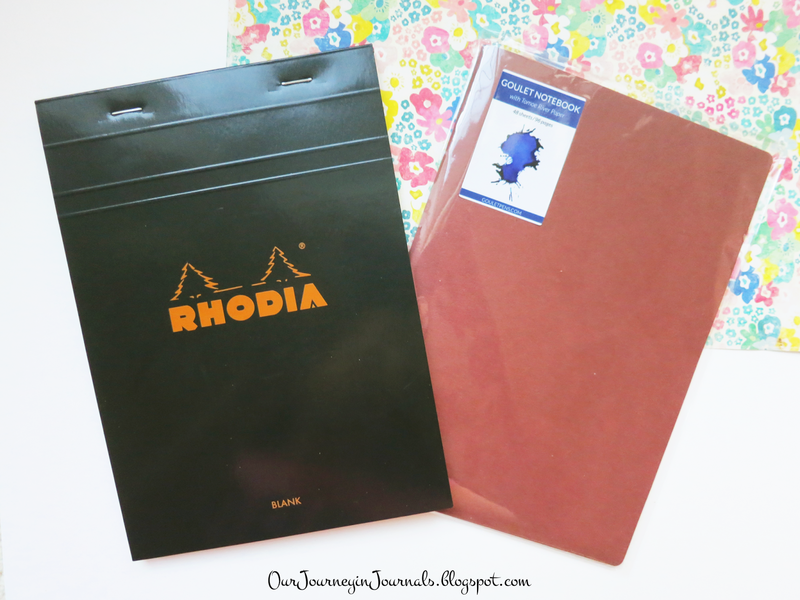 12 Premium lined notepad, a black Rhodia No. 12 dot grid notepad, and a lined Traveler's Notebook Passport Size refill. They came rubber banded together, but the rubber band was loose enough to not bend anything. I haven't tried out all of these notebooks yet, but just by feeling the thickness and smoothness of the paper and knowing the reputations of these different brands, they seem to be really nice. I bought a bottle of ink and many, many ink samples. 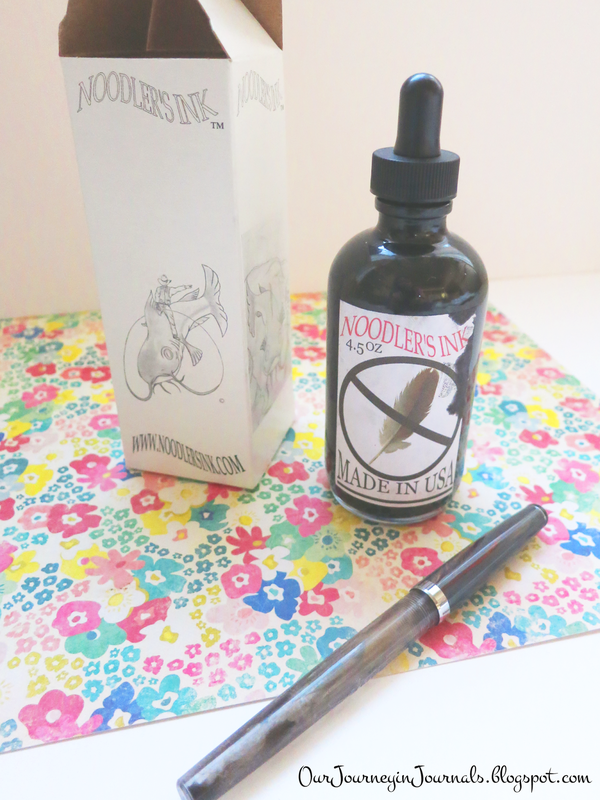 The one bottle of ink I purchased was a 4 ounce bottle of Noodler's X-Feather, which came with a free eyedropper "Charlie" pen (which is actually clear, but I have some black ink left in there). I chose X-Feather because I'm a student, meaning I have to use cheap paper the vast majority of the time. This ink is specifically designed to be used on said cheap, absorbent paper like most school stuff. I've already been using it, and I have to say that I am really impressed! There is pretty much no feathering at all. In total, I got 17 ink samples. 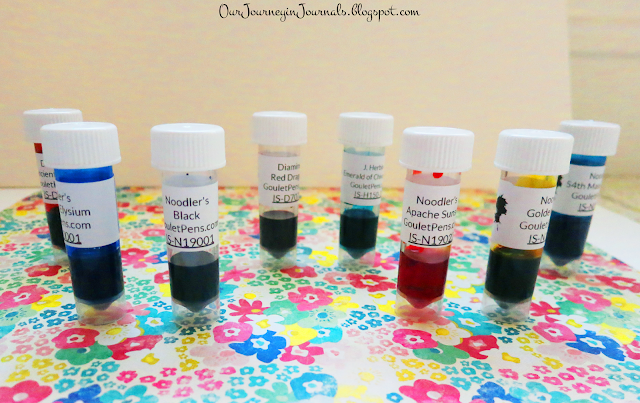 I bought the individual Noodler's Heart of Darkness ink sample, the (8 top) best sellers sample package, and a set of 8 random ink samples. 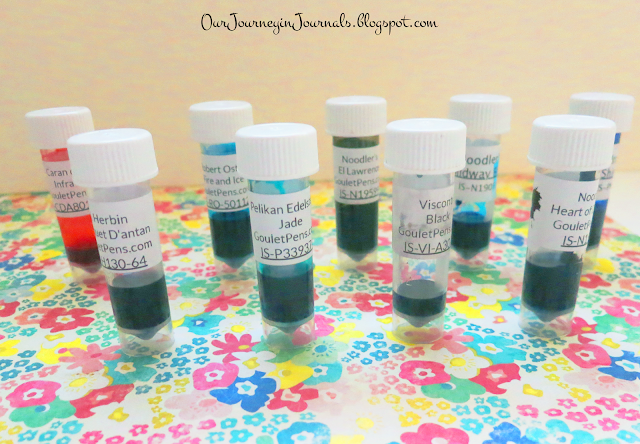 Each sample comes with 2 milliliters of ink, and each set of 8 samples came in a plastic Ziploc bag. I decided to get a crap ton of samples instead of buying full bottles because I want to be able to try out a bunch of inks without wasting anything like I would with a full bottle. The best sellers pack comes with Diamine Red Dragon, Diamine Ancient Copper, J. Herbin Emerald of Chivor, Noodler's Black, Noodler's Apache Sunset, Noodler's 54th Massachusetts, Noolder's Liberty's Elysium, and Robert Oster Fire & Ice. The random sample pack came with Pelikan Edelstein Jade, Caran d'Ache Infra Red, Pilot Iroshizuku Shin-kai, Noodler's Golden Brown, Noodler's Midway Blue, Visconti Black (which I have already used quite a bit of), J. Herbin Bouquet D'antan, and Noodler's El Lawrence. The only thing I have to complain about the Goulet fountain pen ink samples is that since the labels on them aren't laminated or anything like that, it's really easy to get ink stains on them (which I have indeed already done). In addition to fountain pens, notebooks/notepads, and fountain pen inks, I also got a couple of accessory-type things. I bought two fountain pen converters: the Pilot CON-50 piston converter for my Pilot Metropolitan which I got back in August (and which is currently in my Pilot Metro, as pictured above) and the Kaweco converter as an add-on for my new Kaweco Sport like I mentioned earlier. Along with these converters, I also got the Goulet pen cleaning package set. It comes with a bulb syringe, an 8 ounce container of pen flush that also comes with a vial, and two ink (i.e. blunt tip) syringes, which I have already found to be incredibly helpful to use. This was the first time that I ordered from Goulet Pens, but I'm quite sure that it won't be the last. Not only is the selection of products that they offer great, but their customer service is super helpful, and the company as a whole is just amazing. 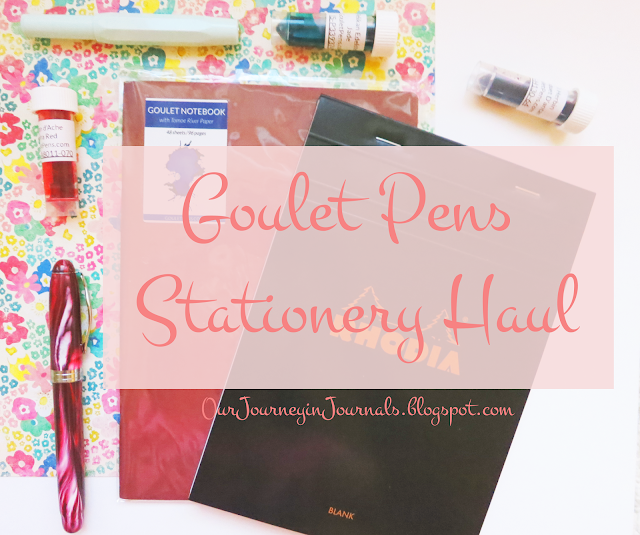 I hope you enjoyed this stationery haul, and I'm also concerned with myself that I may be falling into this addiction that is fountain pens . . . It's not like I wasn't already addicted to stationery before anyway. What was your favorite thing that I got? Let me know in a comment down below!